We do love a dress-up party here at Babyology and can’t think of anything better than seeing little party guests flouncing about in all their frippery. It seems Sonia is a mum after our own hearts. 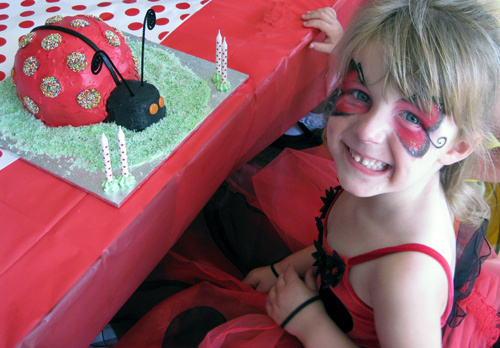 Just look at the pretty ladybird party she put together for her daughter Ella’s fourth birthday recently. Party princess Ella stole the show in her beautiful ladybird costume from Little Gems. Doesn’t she just sparkle! Sonia served traditional party fare to Ella and her friends – that’s code for jelly oranges, chocolate crackles, honey joys and fairy bread. Oh, and we can’t forget the cute-as-a-bug cupcakes! Almost too good to eat, they were decorated in keeping with the theme to resemble bumble bees and butterflies. It’s not just the cupcakes that impressed. We think she did a pretty swell job on the darling ladybird birthday cake too. Sonia, it looks like it flew in straight from the cover of the Australian Women’s Weekly Kids Party Cakes book! 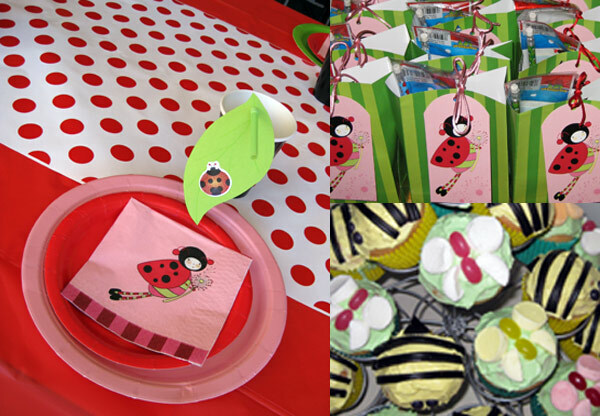 Sonia used cute striped lolly bags from Paper Eskimo, as well napkins and bag tags in the Bella Beetle range. 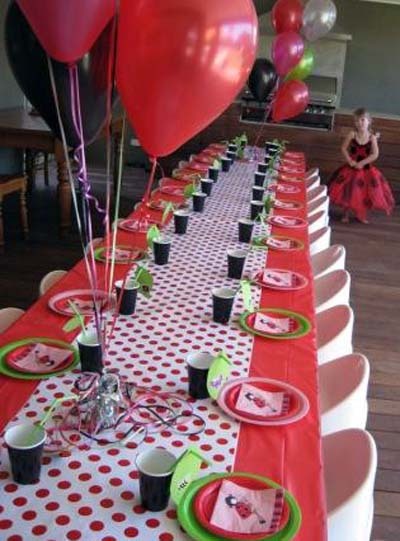 She tied the theme together with pretty pink, red and green paper plates sourced from The Party Parlour. Helium balloons and stylish chairs from her own Melbourne-based party hire business, Tiny Tables and Chairs, complete the stunning banquet table.